Senior consultant – Creatives, Dialog Telekom, has been the Artistic Director of The Workshop Players since its inception. He studied at St. Joseph’s College, Colombo 10 from 1957-69, and then at St. Peter’s College, Colombo 4 from 1969-71. An announcer at the Sri Lanka Broadcasting Corporation from 1972-1979, he owes his theatrical career spanning 37 years to Mrs. Wendy Whatmore, Rev. Fr. Claver Perera, Mrs. Oosha Saravanamuttu Wijesinghe and Mrs. Ena Heynnecker. He has over 75 productions to his credit. 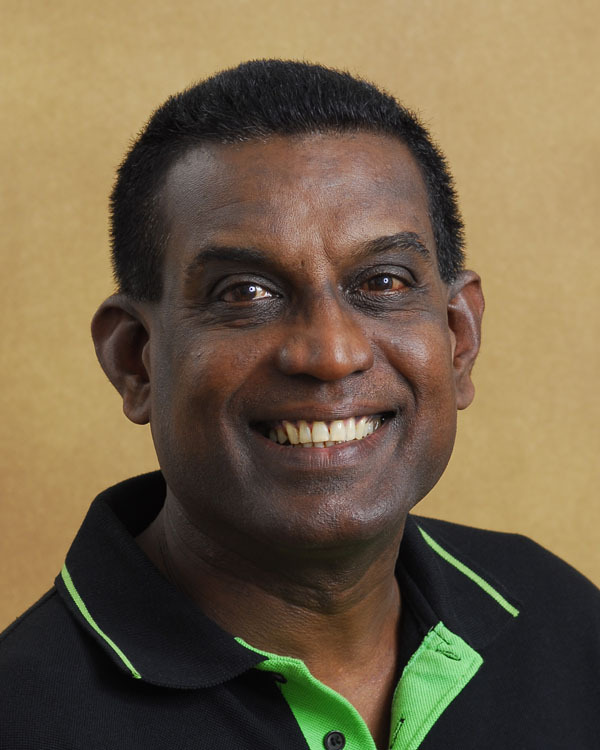 He received the Ten Outstanding Young Persons of Sri Lanka Award for Theatre and Drama 1982 and is also the recipient of the Award from St. Peter’s College for Theatre and Drama at the inaugural Honours Awards in 1983. He was felicitated by D.S Senanayake College, Holy Family Convent Bambalapitiya and the Creative Arts Foundation for services rendered in the field of theatre and drama. In September 1996, he was a fellow at the Salzburg Seminar, Austria for session 340 – “The Power of Theatre, Artistry, Entertainment, Social Commentary”, being a winner of one of the two scholarships from amongst nominees from North Africa, Middle East and South Asia. Course faculty included: Arthur Miller (Death of a salesman, Crucible, All my sons), Ariel Dorfman (Death and the Maiden, Widows), Andre Brink (Elsewhere fine and warm), David Thacker (Director, Royal Shakespeare Company), Benedict Nightingale (Drama Critic, London Times) and Christopher Bigsby (professor of American Literature, University of East Anglia). Jerome participated in Master Classes with the Royal National Theatre actors for Andre Brink and Ariel Dorfman while in Salzburg. He was the producer and Director of highly acclaimed productions of Les Miserables staged in 1996 and 1997, The Royal Hunt of the Sun 1997, West Side Story 1998, directed Ruwanthie de Chickera’s Middle of Silence, April 1999, and The Lion King in September 1999 and October 2000. Macbeth translated by Bandula Withanage and performed in November 2000 was his 12th production as Artistic Director and his first in Sinhala for the Workshop Players. Blood Brothers (2007), his 14th production, was also quite a hit with theatre lovers, with some even putting it on par with West End! At the State Drama Festival 2000, Jerome received the award for choreography for his efforts in the production in Sinhala of The Trojan Women. In 2004 he was awarded best producer for the Sinhala version of the play Widows (Ayeth Enne Nehe) plus six other major awards, including nomination for best director. He was awarded the first ever “Synergy in Theatrum” awarded by the YMCA in 2004, in recognition of his contribution to theatre in Sri Lanka. The Workshop Players hit production Lionel Bart’s ‘Oliver!’ (the musical, in 2006), was an unprecedented success, with the Lionel Wendt being packed to capacity on their 10-night run. The making of Oliver! also saw the birth of the Junior Workshop Players, which since seems to have caught on like wild fire, with over 60 kids coming in for regular weekly practices. Their debut production ‘Bugsy Malone’, complete with gangsters, foam guns and custard (a.k.a. shaving cream) pies, was met with thunderous applause and standing ovations, early this year. Jerome is also the Artistic Director of the premier all-female choir ‘Soul Sounds’ Directed by Soundarie David. Although his primary role is to create the ultimate visual image of the choir, he most often winds up being their biggest critic, disciplinarian, counselor and father figure (a.k.a. “Big Daddy” as he’s fondly known by the girls). He’s toured with the choir to Wales, London, India, Australia and Kuwait, giving them his ever famous pep talks, keeping their spirits high with his constant supply of jokes and making sure they stay focused. He was also instrumental in coaching the choir for the World Choir Games (Choir Olympics) held in Xiamen, China last year, where they won two Silver Medals, although he was unfortunately unable to accompany them. He was with them though at this years’ World Choir Games in Graz, Austria, where the girls bagged three Golds! He’s also conducted many drama workshops during the war and the ceasefire in Jaffna, Batticaloa and Trincomalee and worked with children affected by the tsunami in Balapitiya, Galle and Hambantota and under the AEGIS of the Rotary Club of Colombo, for students from C.W.W. Kannangara Vidyalaya, St. Aloysius College, Richmond College, the ECSAT Foundation and for the inmates of the Juvenile Detention Centre in Kottawa. Brings to mind a wild trip with a group of Royalists (Rohitha, Asoka, Menda, Tomba, you and myself) to trincomalee by night train and the late night dances in the train compartment past Galoya junction, back in 1973-74. Enjoyed much. hi. Jerome pl. let me have ur contact number or e mail address. May i please know your contact number… need to get in touch wit you urgently..
Just watched the movie Common Man with Ben Kingsley. SP Victor, you are a star! Pl send me your email address. Hello Sir, I would love to join acting on stage. I have done the LAMDA gold and now I’m doing my ATCL but I’m still a nineteen year old seed who is dreaming to be a massive tree like you. Please let me know whether you can help me to be that tree. I’m also an Effective Speech teacher at Lyceum International and a Toastmaster. Appreciate if you could give me your contact number ,as my daughter is keen on an audition for your next production..
I’m really impressed by your productions so far. I’m interested in joining too. If you have any auditions or an opportunity pls lemme know. I’m really Interested. Please Let me know if there are auditions. hii!!! Im doing a progect about dramalists…pls tell me your birthday.. I wish to enroll my son (11 years) to your institute. May I have your website add. And your contact details. Hi Jerome Hope you remember as George Sekaran an ardent fan of yours at SLBC along with my late wife Doris Patricia Smith. I came to Srilanka in 1978 and seen you personally at the studios of SLBC and fellow announcer Mahes Perera used to call you Black Gorillajokingly. I wish to enroll my son (10 years old) to your institution. Please send me contact details and the places where you conduct drama classes. Hi Jerome. I am George La Brooys sister Christine Keil. My daughter Karen Keil took part many years back in your play Westside Story. I enjoyed that show, very interesting and colourful too. I want to ask you if I could get a copy of that show please. It that OK with you. please reply. Thanks and God Bless you and protect you. Why I am fanatic about ‘the’ opera but not quite a "phan"
Laughter, hard work and Hakuna Matata!